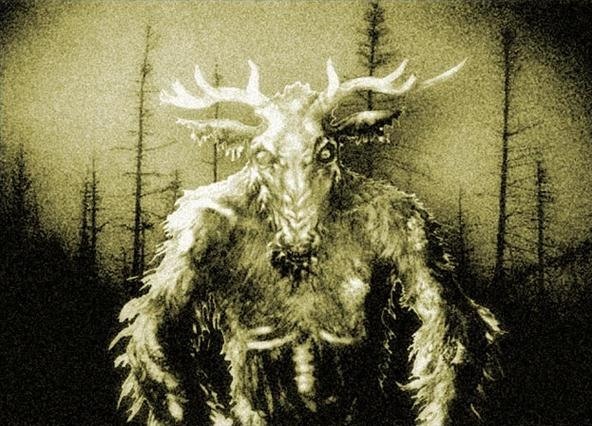 The WENDIGO (or WINDIGO) is a malevolent creature from the mythology of the Algonquian, one of the most populous and widespread Native American language groups, which includes such tribes as the Innu, Ojibwe, Shawnee and Wampanoag. According to the tradition, the wendigo is mythical supernatural spirit (a MANITOU) that practices CANNIBALISM. Legend states the first known wendigo as a lost hunter that was forced by hunger to consume human flesh, eventually mutating into a crazed man-eating ogre roaming the forest. But generally, wendigo refers to an evil CANNIBALISTIC spirit into which humans could transform, or that could possess humans. Those who indulge in ANTHROPOPHAGY (cannibalism) were at particular risk at becoming possessed. Today, most American Indian tribes use wendigo to refer to anyone who has eaten human flesh, not just those possessed. 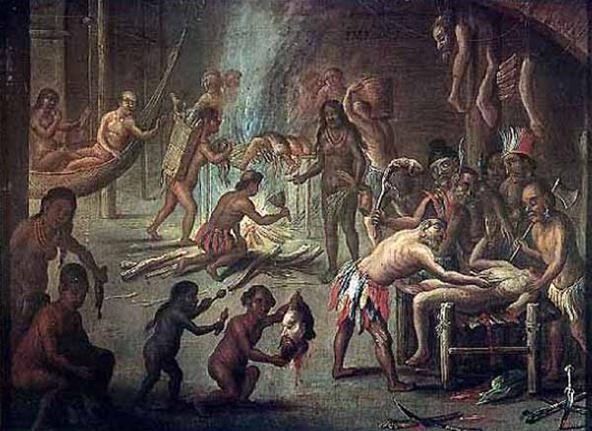 Cannibalism in most Native American tribes is considered taboo, even to save one's own life. The correct response to famine would be suicide or resignation to death. 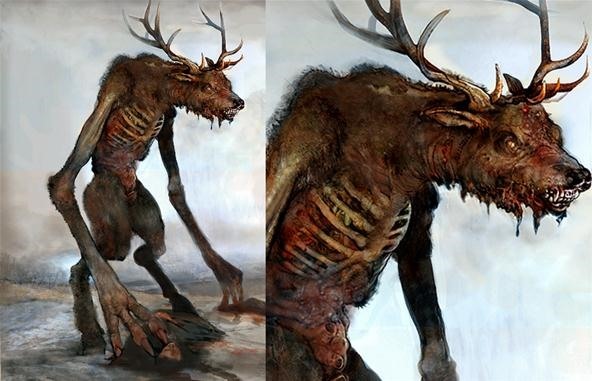 In psychiatry, "wendigo psychosis" is a culture-bound syndrome that refers to a condition in which sufferers developed an insatiable desire to eat human flesh even when other food sources were readily available, often as a result of prior famine cannibalism. Most suffering from these fever-induced delusions recognized the symptoms as their transformation into wendigos, and therefore asked to be executed before harm could be done to others. The spirit possesses the cannibal's body, forcing the human soul out, causing immense nausea and pain. Uncontrollable vomiting lasts for hours, until the human loses too much water and blood, eventually dying. The body then begins the transformation, growing great strength and height, a thick coat of white fur, a predatory head, fangs and sharp teeth, and razor sharp fingernails and toenails. He is no longer man, but wendigo. Sound familiar? That's because it bears significant resemblance to some cannibalistic REVENANTS, such as ZOMBIES, and even more resemblance to WEREWOLVES. Since a wendigo is never satisfied after killing and consuming a human being, the notion of wendigos is directly connected to gluttony, greed and excess, therefore serving as a method of encouraging cooperation and moderation within tribes. 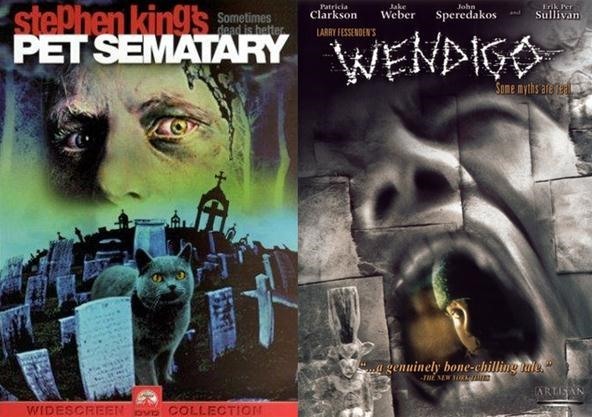 Halloween-worthy horror fiction relating to wendigos includes Stephen King's Pet Sematary (book and movie), the 2001 horror film Wendigo, Ravenous from 1999, or the horrible Wendigo from '78. If you're looking for horror films with similar creatures, just watch any werewolf movie, like The Howling.